This electrically-operated, oversized wheelchair/platform scale is multifunctional. It weighs patients in care, especially heavy patients, persons in wheelchairs and seated patients with circulatory trouble, even during dialysis. The flexible cable remote display can be placed anywhere (on a desk or table) for convenient read-out and operation of the controls. A wall mounting is also provided.Transport castors and a handle make the seca 674 mobile. SKU: seca674. Categories: Medical, Seca. Drive-up ramp seca 470 included. 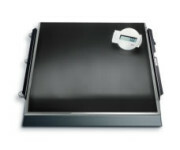 • Suitable for weighing patients in a wheelchair or chair. • Flexible cable remote display. Large platform with high load-bearing capacity. This generously-sized wheelchair/platform scale is multifunctional. It weighs patients in care, especially heavy patients, persons in wheelchairs and seated patients with circulatory trouble. of the controls. Wall mount and seca 470 drive-up ramp is included. Transport castors and a handle make the seca 674 mobile. The Pre-TARE function simply subtracts the added weight of the chair or wheelchair and provides the weight of the patient alone. Not every patient can step onto a scale quickly and easily. Despite its size, the seca 674 is amazingly easy to handle. When upright, the scale can be moved easily on castors and steered by means of the integrated handle.